Woven shibori scarf in progress. It’s been a long and very cold winter, and I will spare you photos of the last blizzard. It’s also been a period when I wasn’t feeling 100%, and more than anything wanted to hibernate, and often did. Perhaps spring is on the way? 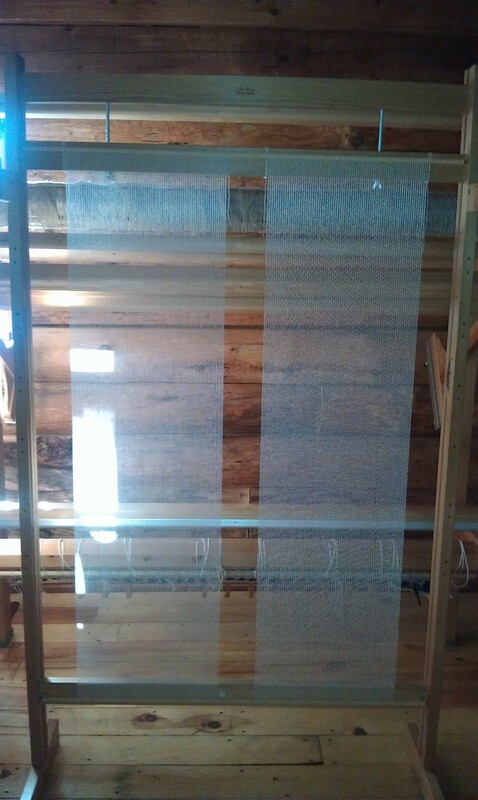 I want to weave, and am back working on a somewhat narrow warp for woven shibori scarves (above). This scarf is being treadled randomly and the number of plain weave rows between each “pattern” row also varies. 16/2 Bockens cotton, sett 30 epi, and I’m using a neutral color of rug warp for the pattern rows which are removed after dyeing with indigo. 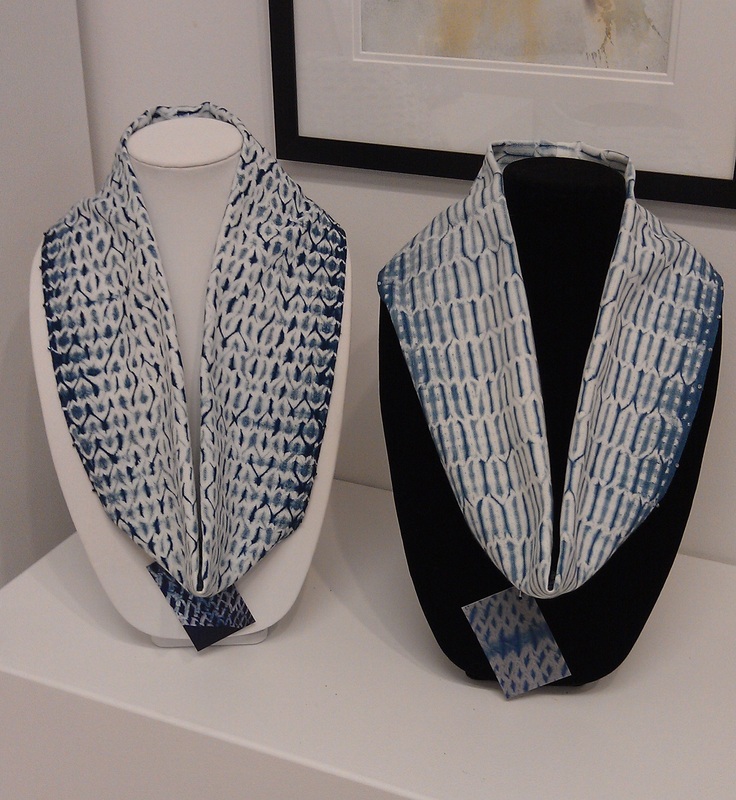 Stay tuned to see the finished scarves! 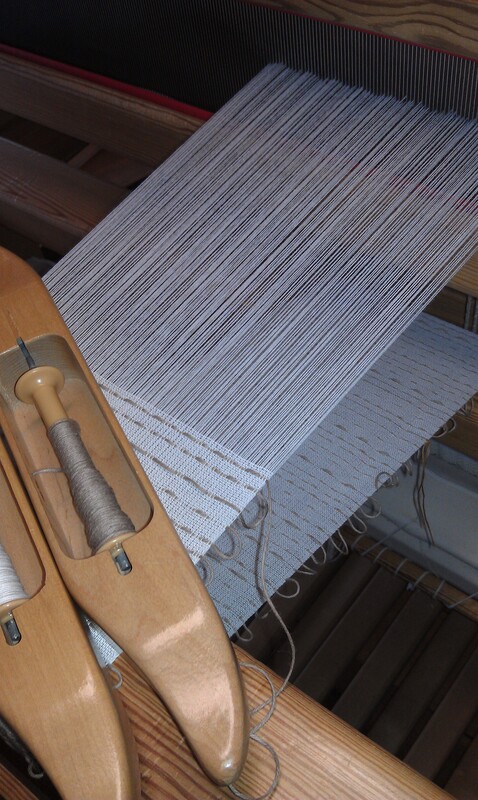 Drawloom warp is threaded, sleyed and tied on, ready to weave. If I remember correctly this is a 20/2 cotton warp, sett 64 epi for 5 shaft (ground) satin. 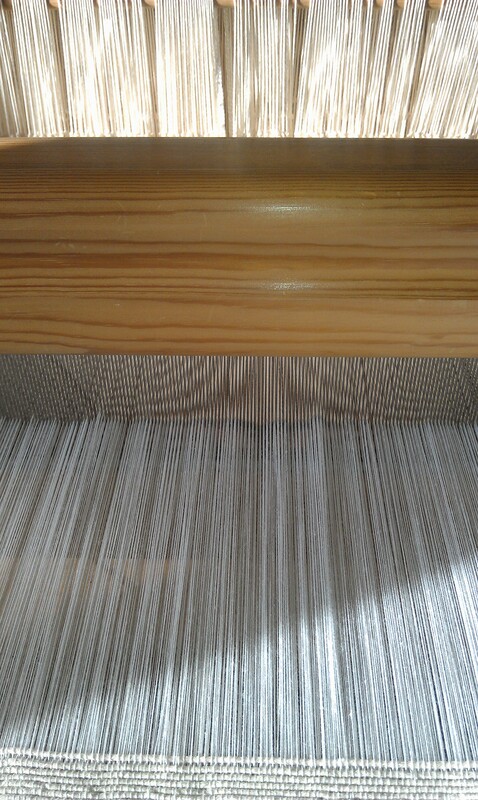 The warp is spread and I’m ready to begin weaving. Time to locate a chart I’d like to weave, to begin, then dig out designs I was working on, simplified from photos I took in China years ago. I still need to transfer (and possibly enlarge a bit) to graph paper. The Glimakra “Sara” upright tapestry loom is a simple frame-type loom, tall, on legs, adjustable weaving length, and has hard plastic “teeth” top and bottom to wrap yarn on. This loom can be warped at 5 epi or 10 epi. I may regret it, but I warped it at 10 epi with bleached 12/6 seine twine after finding the linen I was going to use was a bit too wide/coarse for that sett. It is warped in two sections for a tapestry daily calendar. I had decided to try this in February, then promptly came down with a head cold. Now, I can either make up the weaving, or start March 1st. The idea of a tapestry diary or daily calendar is to weave a small bit each day which is appealing and doesn’t feel overwhelming. I’ve been debating with myself over how to approach this weaving,… vertical or horizontal? A particular shape (square, rectangle, trapezoid)? Freeform? Color approach? I do know this will also be a good way to learn and experiment with tapestry techniques, and color. It’s time to sit down at the loom and take the first step, then I’ll be asking myself what took so long. Behind the “Sara” loom in the photo above is the new-to-me “Regina” tapestry loom. Part of the studio was rearranged to make a nice home for it, lights will be installed shortly, and I’m waiting for a new 8 dent stainless steel reed to arrive, again, from Gowdey Reed Company in Rhode Island. The pace of life is about to pick up. My younger daughter’s wedding is in two weeks. We’re hoping the weather will begin to warm up a bit in early April so we can begin refinishing floors, then treating the log walls. Our first seed order arrived and very soon we’ll be setting up and “fencing” a table in the basement where we can start seeds (and keep the cats out!). After the snow has melted and frost is out of the ground, we’ll set up raised beds, put up fencing, and plant vegetable and flower gardens. We’re planning to add bees next year. And while all those projects are going on, the weaving must continue, and we’re finally going to add the opphamta attachment to my Standard loom, something I’ve been waiting years for. In addition to the Northwoods Art Tour, and one or two open studio days of our own, I’ll again participate in a show with the Art Gypsies. 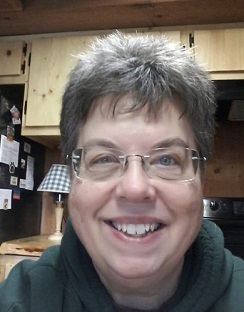 A busy and exciting year coming up!